I am linking this in to the monthly In My Kitchen event, hosted by Maureen of The Orgasmic Chef. In my kitchen this month, I have a surprising number of coconut products. I've obviously been in a coconut milk phase without even realising it. There are two flavours of the Rebel Kitchen coconut mylk drinks (chocolate and banana), which aren't cheap, but are nice to have in my handbag or on standby in the fridge at work. 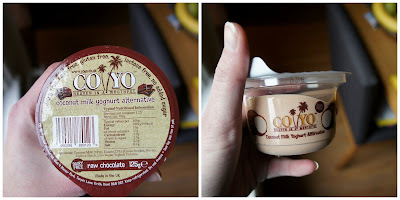 My kitchen has also housed my favourite coconut yoghurt, the chocolate flavour by CoYo. It is delicious and very satisfying. To round out the coconut products. Tesco have a new coconut rice pudding with strawberry puree. I like it a lot, and also like that the puddings come in sturdy plastic tubs that are good enough to wash and re-use. Another new and exciting product is vegan Quorn pieces, which some of you may have seen me mention on Facebook. I've been waiting for the vegan Quorn range for months and this is the first product I've seen. I love the pieces, which mimic chicken in texture exactly, and from memory taste pretty similar to it too. I've used them in a tomato-based spaghetti dish and had some plain with soy sauce (they're that good!). Also in my kitchen, as well as elsewhere in the house, are new books. By 'new' I mean 'second hand'; my grandparents are trying to downscale their belongings and I visited on the weekend and took some 60+ books away with me. Our bookshelves are now at capacity, but we're delighted with the new reading material, and it's a bonus to have these books linked with my grandparents. In my kitchen there have been several melons. I seem to be in a melon phase - honeydew and cantaloupe are featuring regularly. Last but not least, in my kitchen there have been English muffins with marmalade. Joey of Flicking the V's mentioned eating them in one of her recent posts, and it sparked off a major craving in me. They're delicious. My kitchen is quiet this month. Marion's belly has been bothering her so she's been "sipping" on home made soups, canned soups, (ever so salty but she likes them) and lots and lots of Jell-O! What a catch those books are. Perfect time of year aroud these parts for catching up on reading. Good for you! I wish there were some English Muffins and Marmalade in my kitchen right now, oh yum! Thanks for sharing, Kari...what a fun event! Thanks for stopping by Louise, and I hope Marion feels better soon. It sounds like you're feeding her well! Some coconut-milk ice cream that I had once was really great. Since I don't avoid dairy products I haven't tried the yogurt or beverages, but it sounds as if you are experimenting with all the possibilities. Your grandparents are lucky to have someone that wants their books. 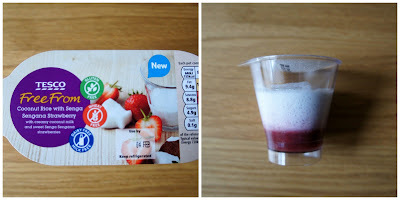 I had a taste of the rebel mylk and it is good - the packaging is really cute too. I have found coyo too rich but would be interesting to taste their chocolate one. How lovely to have books from your grandparents - hope you might have some interesting discussions with them when you have read some of their books. And it is funny you have marmalade on muffins which seems so wintery and melons which seem so summery! Coconut is all the rage at the moment and why not. 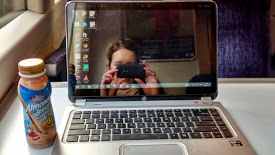 I am loving a KoKo non dairy milk that I discovered at Vegfest last year. I am still looking out for Rebel products in my part of the world, they will arrive I know they will even if it takes a visit to Cardiff. Oh, I hope they reach you soon - I am seeing them more and more so I am sure it won't be too long now. What a healthy range of food you have in your kitchen at the moment. I love marmalade, especially nice tart marmalade! Marmalade should always be tart, shouldn't it! Thanks Julie. I love the Rebel Mylk - the orange ones are really good. It's a shame that they are a little expensive, but nice for a treat. Funny when you are going through a phase and don't even realize it isn't it?. Oh yes Marmalade I love it. The chocolate and banana coconut milks look delicious, I haven't noticed anything like that here. I may have to look around now. I made coconut yogurt last month and that was popular with the kiddos. English muffins is on my list of things to make from scratch, soon. I have never made them from scratch so admire your ambition! I can imagine Coyo being the perfect substitute in those dishes! i know people love coconut yoghurt but i tried it once and shuddered. not for me:) how lovely to have more books especially from your grandparents.